RaceDeck Interlocking Tiles are great for garage floors, parking mats, showrooms, event floors, outdoor event flooring and more. Made in USA. Available in Diamond, Circle Trac, Free Flow, Tuff Shield, XL 18", Harley Davidson Logo Tile. Easy Do-It-Yourself Install. "Patented" multi-purpose interlocking floor tiles simply snap together, no special floor preparation. Resistant to oil, grease, petroleum products, antifreeze and chemicals. No tools needed! Installs in just hours! Built to handle extreme rolling load capacities. UV stable can be used on any flat surface indoors and outdoors. Easy to clean - just hose it off. Create attractive patterns easily. Contact our sales staff with your ideas and we will send you a design layout. Fast Deck Portable Floor Tiles 12" x 24"
RaceDeck interlocking garage floor tiles are easy to install by simply snapping together. The RaceDeck tile comes in a 12" x 12" Tile and an (18" x 18" limited patterns), is available in many attractive patterns and colors. The RaceDeck Tile is versatile where you can lock together different patterns and colors to create a unique floor design. The RaceDeck tile installs right over your existing floor, no need to remove stains or fix cracks, and installation is quick and easy enough to install yourself without expert installers. Easy Do-It-Yourself Install. "Patented" multi-purpose Race Deck interlocking floor tiles are resistant to oil, grease, petroleum products, antifreeze and chemicals. No tools needed! Installs in just hours! Built to handle extreme rolling load capacities. UV stable can be used on any flat surface indoors and outdoors. Easy to clean - just hose it off. Made in USA. Once RaceDeck tiles are a rigid PVC tile, and once snapped together you have a seamless look. The pattern is continuous, so when you lock together the Diamond Pattern, the next tile will match up with the pattern. Since RaceDeck is seamless, you can mix colors easily, and create a really cool pattern and color scheme for your garage or area. You can install this product wall to wall or just a small area to park equipment on. With the new Harley Davidson RaceDeck tile you can create a cool Harley theme, or mix the Harley tiles into your floor design. 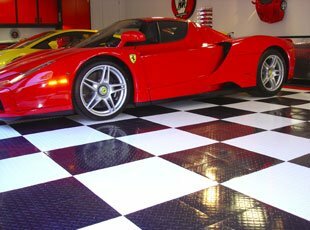 Race Deck interlocking floor tiles and modular garage flooring are cost-effective alternatives to epoxy floors. Epoxy floors can take days to apply, with many steps. The Race Deck flooring can be installed in just hours and without the toxic fumes associated with epoxy floor coatings. There is no special floor preparation required other than sweeping and clearing your concrete floor, then just "snap" the patented interlocking floor tiles together in the pattern and colors you desire. Epoxy floor paints can begin to peel away in just months, and stains easily. Once you have a stain or peeling area on an epoxy floor there's no easy way to fix a small area of painted floor, but with the Race Deck's 15 year limited warranty your Race Deck floor will outlast epoxy paint. RaceDeck Tiles come in the popular Diamond Pattern, Circle Trac, Free Flow, and Harley Davidson. The TuffShield Race Deck has an added gloss to the tile, and is available in the RaceDeck Diamond Pattern, and Harley Davidson. The Race Deck Diamond and Free Flow comes in an 18" x 18" Tile. With the RaceDeck Tile you have no worries for years to come! The Race Deck tile can be used in the garage, on decks, events, around pools, they have added UV protection, safe for indoor or outdoor uses. Contact our sales staff for assistance in creating a floor design. RaceDeck is the Industry leader with more modular garage flooring sold and installed than all other competitors combined. A “multi-patented” system of interlocking floor tiles that has been engineered to withstand the toughest mechanical environments. Engineered to handle extreme vehicle rolling load capacities. The toughest in the Industry. Designed to keep you and your machine up and away from dirt, mud, debris, and flowing liquids – giving you a professional clean work area. Installation is a “SNAP”! No tools required – our garage flooring tiles simply “snap” together to form any size custom floor. UV stable and stain resistant. Engineered to be used on any flat surface – both indoors and outdoors. Easy to clean. Just hose off or mop it. More color and style options than all other modular garage flooring manufacturers combined. 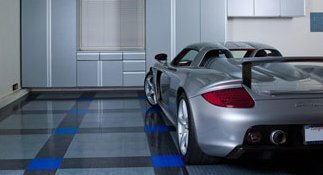 Race Deck garage flooring is a multi-purpose interlocking floor system designed to withstand the toughest mechanical environments, and is not affected by automotive chemicals. 1. Question: How long does it take to ship my order? Answer: Most orders are processed by the next business day. 2. Can this be installed over a painted concrete floor? Answer: There is virtually no preperation to install Race Deck Flooring. Simply sweep the area and remove debris and install your floor. You do not have to remove paint, or get up stains prior to installing. 3. How do you cut this material? Answer: Easiest way would be to use a table saw, or for hard cuts you can use a jig saw. 4. Can you install outdoors? Answer: Yes, this product has added UV Stability - is great for displays, setting up on grass or outdoor areas for events. The drain top is great for basketball courts or sports flooring. 5. Is it easy to take up once installed? You can take up or replace a tile, or the whole floor. You simply unsnap one tile, and then you are able to remove just a few or many.